Yugoslavia was a country which existed as a kingdom from 1918 until 1941 and afterwards as a socialist country from 1943 until 1991. Yugoslavia was an amazing mix of people, languages, religions, cultures, history and geography. 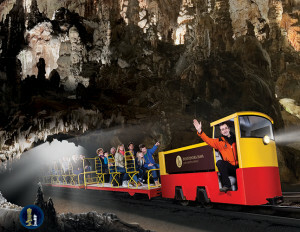 In 1991 Yugoslavia broke up into new countries, therefore, we invite you to explore them. Recepti on at the Zagreb Airport. Evening tour of the capital city of Croatia includes a walk through Donji grad until the Kaptol. We’ll see the Cathedral, the largest church in Croatia. Afterwards, we will see Gornji Grad, Bloody-bridge, Stone Gate and St. Mark’s Square. Dinner will be at one of the restaurants in the picturesque Tkal?i?eva street. Hotel accommodation and overnight stay is included. The journey will lead us through Karlovac, the town which is named after its founder, the Austrian archduke Karl. II Habsburg. We’ll continue along the valley of the river Korana to Slunj and towards the National Park Plitvice where we will see Plitvice Lakes. Natural beauty presents sixteen lakes in beautiful blue-green pastel colors, which reflect the surrounding forests. Water in the waterfalls flows from lake to lake. 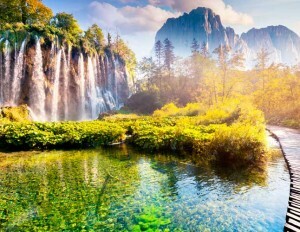 The Plitvice lakes National Park is listed as one of the natural heritage sites by UNESCO. 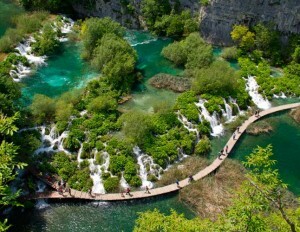 Our journey will continue towards the Adriatic Sea and along its shores to the second largest Croatian city, Split. Hotel accommodation and overnight stay are included. Sp lit- sightseeing and visiting Diocletian’s Palace which is on the UNESCO list of World Heritage Sites. At the beginning of the 3rd century, it was built by the Roman emperor Diocletian, born in Solin near Split. 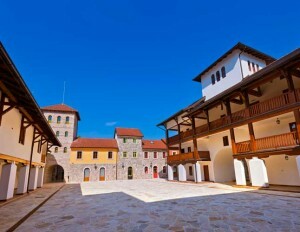 A walk around the 1700-year-old palace is actually a walk through the heart of today’s Split. On the central square called the Peristil, we are actually standing on the original cobbled almost two thousand years old Roman street. 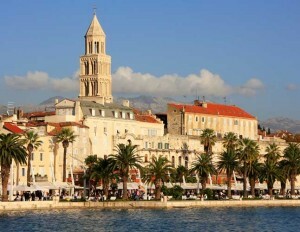 We’ll also visit Jupiter’s temple, Cathedral of Split, St. Domnius Liberty Square or Prokurative and much more. In the afternoon, you will have some spare time to explore the city yourself. Overnight stay is included. In the morning, we will head towards the coastal town of Neum, where we will pass the Republic of Bosnia and Herzegovina for 5 km, and again return back to Croatia. We will continue to the scenic coastal road along the Peljeљac peninsula and past through Elafit islands into Dubrovnik. We’ll explore the city which is the pearl of southern Dalmatia, an old town which is listed on the UNESCO list of World Heritage Sites. 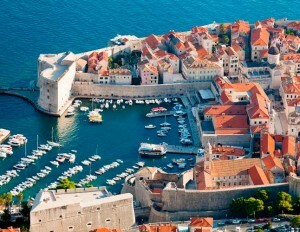 We will experience the charm of the remaining buildings from the time of the old Dubrovnik Republic. We will also enjoy the view of the Renaissance architecture with some traces of Gothic. The Franciscan monastery with one of the oldest pharmacies in Europe, stroll along the central street Stradun, the Sponza Palace, the church of St. Blasius, the majestic cathedral. Hotel accommodation and overnight stay are included. Our journey will continue into Montenegro through Herceg-Novi, at the bay of Boka Kotorska into Lov?en National Park (Mausoleum of P. Petrovi? 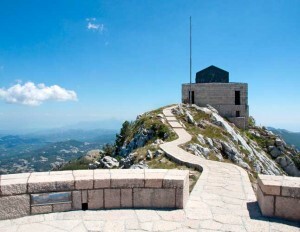 Njegoљ, the founder of Montenegro country) and Cetinje (the historical capital of Montenegro). 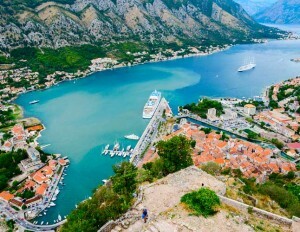 We will have a short stop in Budva and afterwards, we’ll return back to Kotor. The bay is also known as “the most southern fjord in Europe.” Hotel accommodation and overnight stay are included. In t he morning, we will stroll through the medieval fortified town of Kotor and visit the old city center. The small town boasts 18 churches, a basilica and 2 monasteries. The Venetian influence left its own distinctive mark on the architecture of the old town, which is under the protection of UNESCO. Afterwards, our journey will lead us to Bosnia and Herzegovina through Trebinje into Mostar (a short tour) and all the way to Sarajevo. Hotel accommodation and overnight stay are included. We will visit the heart of the old Sarajevo, see sites such as Baљ?arљija, Vije?nica, the most representative building from an Austro-Hungarian period, built in pseudo-Moorish style, Gazi Husrevbeg’s mosque, Old Orthodox Church and the Catholic cathedral. We will also visit the bridge of Gavrilo Princip where he assassinated Archduke Franz Ferdinand, which triggered the start of the World War I (1914). We will have the opportunity to try typical Bosnian brunch; ?evap?i?i or pljeskavica in bread, perhaps burek. In the afternoon, we will visit the underground tunnel under the airport (“tunel spasa”), which was, during the war (1991), the only way out of besieged Sarajevo. We will visit the source of the river Bosnia, the so-called “vrelo Bosne.” After we return to the city, we will take an elevator and ascend the tallest skyscraper in the Balkans, Avaz which is 142 m high. Overnight stay is included. After breakfast, our journey will lead us to Serbia, with a stopover in Viљegard. We will see more than 500 years old Turkish stone bridge which was described by the Yugoslav Nobel Prize winner Ivo Andri? in his novel Most na Drini. Afterwards, we will visit Kamengrad, which is based on the ideas of the film director Emir Kusturica. If you desire, we can dine in one of the restaurants in Viљegrad. Once in Serbia, just across the border, we can also visit Drvengrad, another city which was constructed by the idea of Emil Kusturica. The path through Serbia will lead us through Bajina Baљta and Valjevo all the way to Belgrade, where we will arrive in the evening hours. Hotel accommodation and overnight stay are included. After breakfast, we will have a tour of Belgrade, a former capital of Yugoslavia and today’s capital city of the Republic of Serbia. From the Kalemegdan fortress in Belgrade, we will have a wonderful view of the confluence of the rivers Danube and Sava. 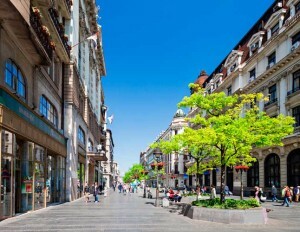 We will also visit the Sahat tower and stroll down the Knez Mihajlo street. 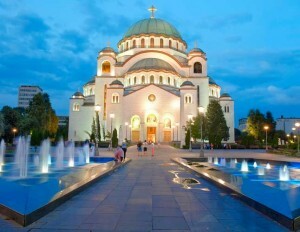 Afterwards, we’ll visit the former Federal Assembly of the former Yugoslavia and visit the mausoleum of Josip Broz Tito and his wife Jovanka Broz, called “Ku?a cvije?a.” The next stop is Church of Saint Sava, the biggest Orthodox church in the Balkans. Dinner is recommended in the bohemian quarter Skadarlija accompanied with “starogradska” music. Overnight stay is included. After breakfast journey will lead as from Belgrade to Novi Sad. 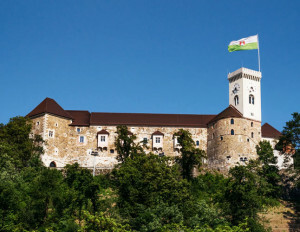 We will visit the Petrovaradin fortress which was built by the Austrians at the end of the 17th century to defend themselves from the Turks. The journey will lead us through Croatia to Ljubljana, which has become the European Green Capital 2016. Hotel accommodation is included. We will take an evening walk and visit Preљernov Square, Triple Bridge, Church of St. Nicholas, Town Square with the baroque fountain, Town Hall, and much more. Overnight stay is included. 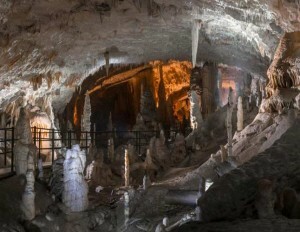 After breakfast, we will visit Postojna which is known by its the largest karst cave in Europe, called Postojna Cave. We will continue to Goriљka Brda, also known as “Slovenian Tuscany”. We will climb up towards the seeing tower from where we will see the Adriatic Sea, the Vipava Valley, Julian and Carnic Alps, Dolomites, Friuli (Italy) and the Kras plateau. 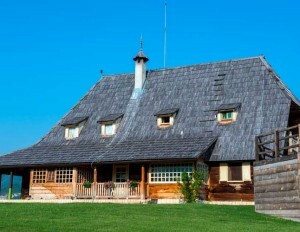 Lunch with wine tasting will be served in one of the many picturesque tourist farms in the Goriљka Brda. In the late afternoon, we will drive to Trieste, a coastal town where Romance, Slavic and German culture have been intertwining for more than 1000 years. We will visit Miramar mansion, market Unita d’Italia, Canal Grande and much more. We will return to Ljubljana in the late evening hours. Overnight stay is included. Includes: Pick up at the Zagreb Airport, transfer and all needed transportation, guided tours, 11 Hotel accommodations and overnight stays in double rooms (served with breakfast) in 3 or 4 * Hotels, entrance fees to: Plitvice Lakes, Cathedral of St Domnius, Diocletian’s Palace, Dubrovnik City walls, National Park Lov?en, the underground tunnel “tunel spasa”, Drvengrad, Sahat Kula, Ku?a cvije?a, traditional Serbian dinner, the Petrovaradin fortress, Postojna Cave, Miramar Castle, Slovenian lunch with wine degustation, organization of the journey and English speaking guide. Your private driver is an excellent licensed guide who will guide you through detailed itinerary through former Yugoslavia locations. Price includes: Pick up at the Zagreb Airport, transfer and all needed transportation, guided tours, 11 Hotel accommodations and overnight stays in double rooms (served with breakfast) in 3 or 4 * Hotels, entrance fees to: Plitvice Lakes, Cathedral of St Domnius, Diocletian’s Palace, Dubrovnik City walls, National Park Lov?en, the underground tunnel “tunel spasa”, Drvengrad, Sahat Kula, Ku?a cvije?a, traditional Serbian dinner, the Petrovaradin fortress, Postojna Cave, Miramar Castle, Slovenian launch with wine degustation, organization of the journey and English speaking guide. Your private driver is an excellent licensed guide who will guide you through detailed itinerary through former Yugoslavia locations.